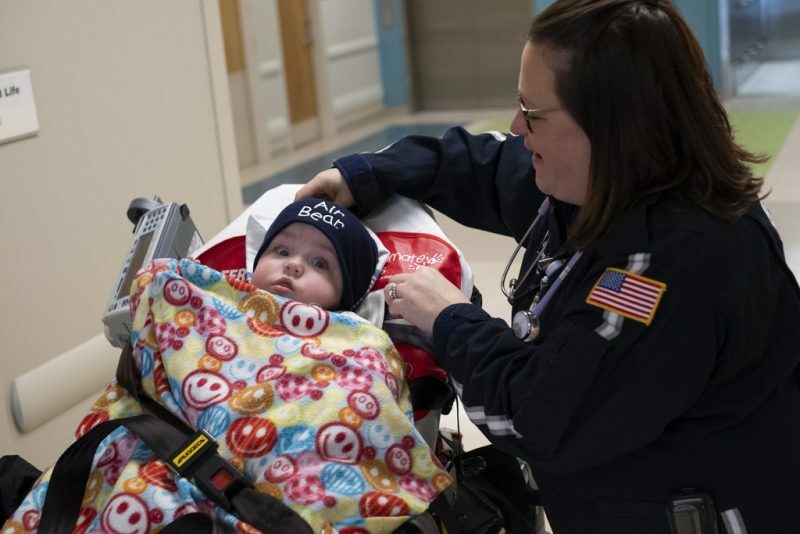 Brittany and Evan Hill are taking baby Stephen home after 11 months in the NICU. Brittany Hill has been dreaming of the day when she can wake up and have her whole family under one roof, when she can play with her baby, Stephen, on her living room floor, when she no longer has to drive more than an hour to see him or wish him “sweet dreams” at bedtime by telephone. 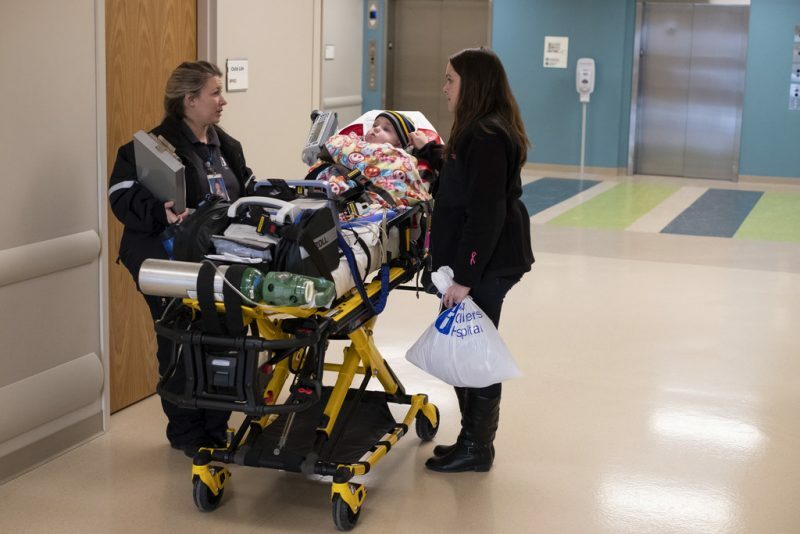 Her dreams finally came true today when Brittany and her husband, Evan, of Mansfield, brought 11-month old Stephen home from Akron Children’s Hospital’s Neonatal Intensive Care Unit (NICU), where he has been since being born premature at 25 weeks. Stephen was born premature at 25 weeks as has faced a roller coaster ride of health challenges. “I can’t wait to have Stephen sit in my lap and to read him books, and just be home and surrounded by people who love him,” Brittany said. 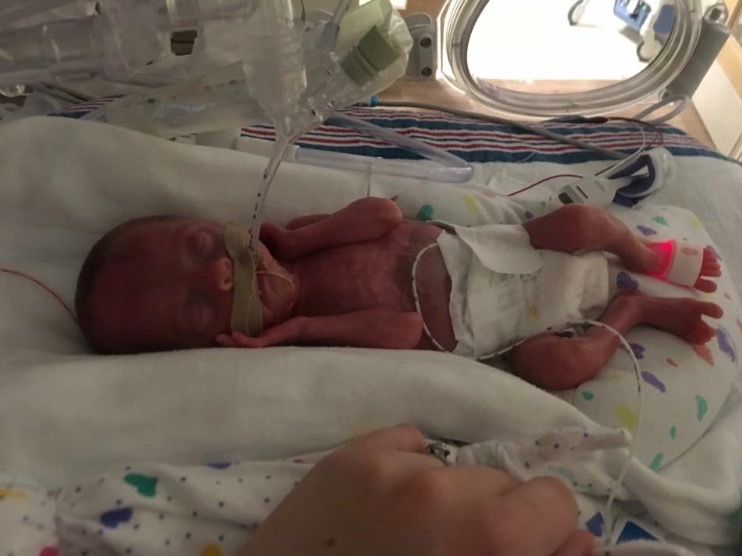 A few weeks before Stephen was born on Feb. 17, Brittany showed signs of premature labor. She was put on hospital bed rest and given progesterone. She saw a maternal fetal medicine specialist and continued with bedrest at home. But, Stephen was determined to arrive early – very early. 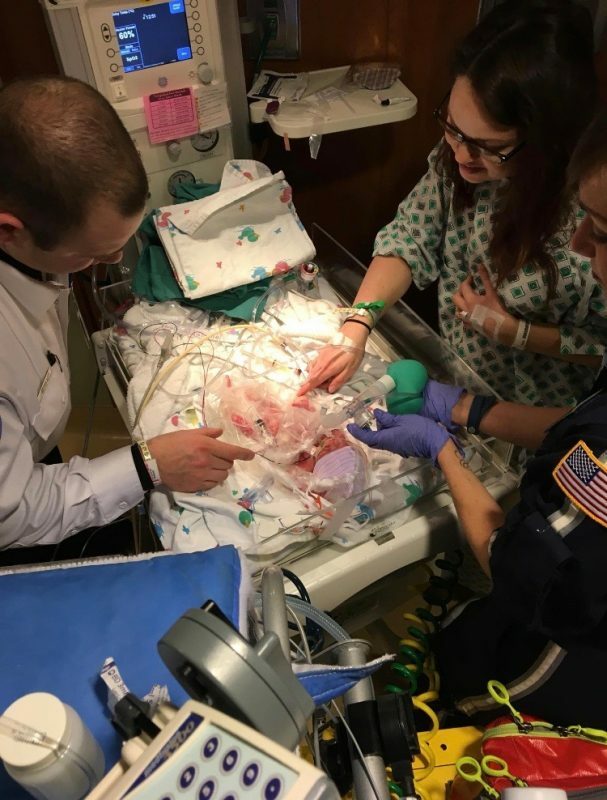 After Stephen was born at a Mansfield hospital, weighing just 1 lb., 14 ounces and measuring 13 inches – Brittany and Evan nervously awaited the arrival of Akron Children’s transport team, which immediately intubated him and got him on the road to Akron in a mobile ICU unit. “His Apgar scores were not good; we said the first of our many prayers,” said Brittany. Chronic lung disease and seizures are two of the biggest issues caused by Stephen’s prematurity. He is on a trach and vent, and had to undergo surgery for hydrocephalus (a shunt is placed in the brain to help drain fluid and relieve pressure). 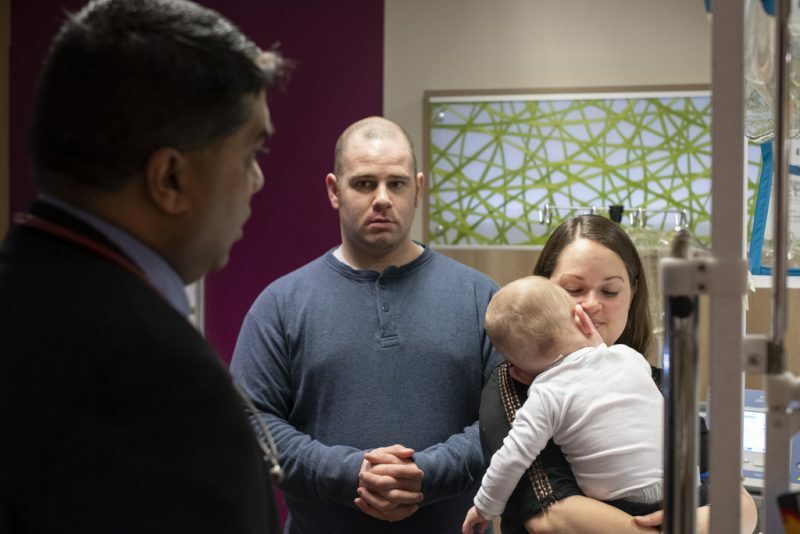 Over the course of his NICU stay, the couple lost count of the number of tests and procedures their baby boy underwent – with all the necessary fear over what would be revealed. This is where the NICU staff stepped in to provide the education and the support the family needed. 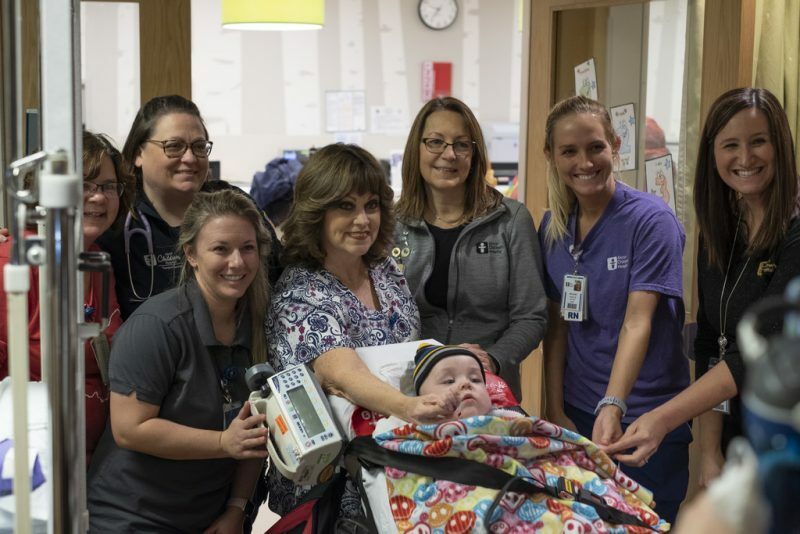 Brittany and Evan became especially close with neonatologist Dr. Alison Protain, neurologist Dr. Vivek Veluchamy, and NICU nurses Shawn Lundholm, Becky Pelfrey, who was with him nights, and Ashley Fagan, his primary day nurse. Nurse Becky Pelfrey rocks Stephen for a final time in his NICU room. 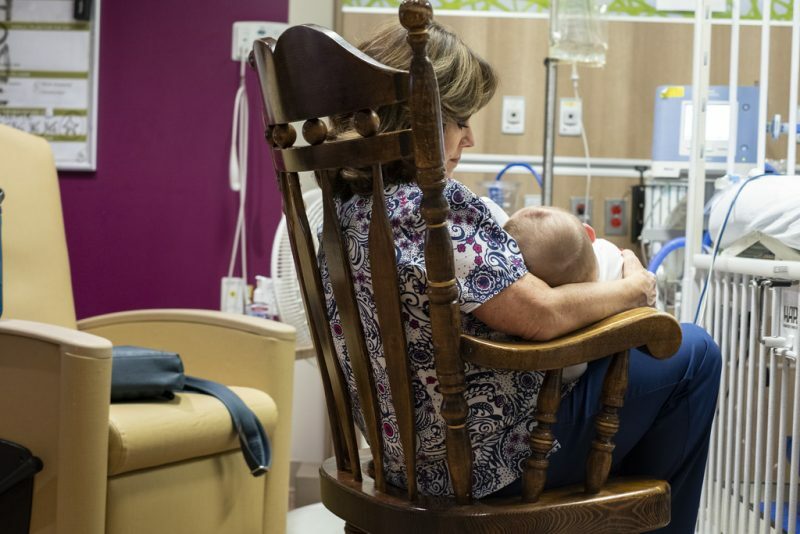 It’s probably difficult for parents of healthy newborns to imagine the stress parents of NICU babies face – the tough decisions that can impact your child for life, the constant packing of overnight bags, the numbers of meals grabbed in a hospital cafeteria rather than cooked at home, the concern over mounting medical bills, and the melancholy over missed milestones. 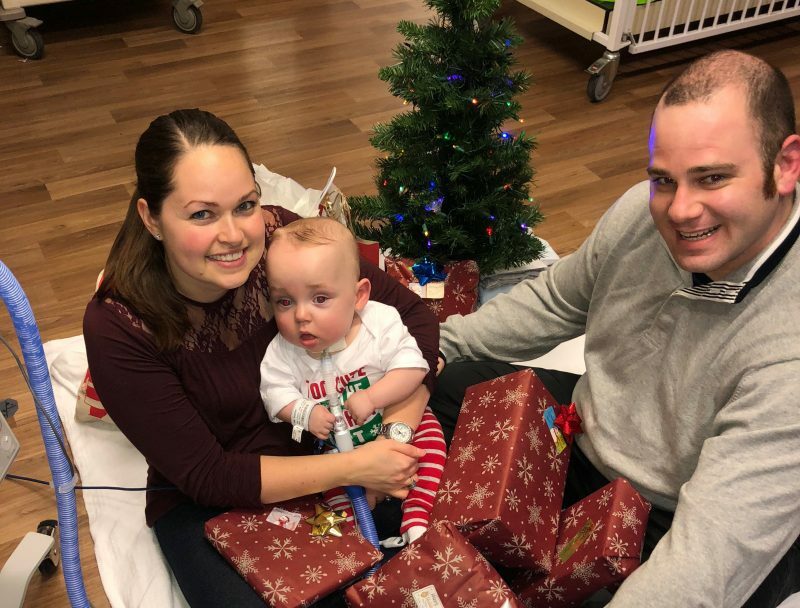 Brittany and Evan Hill celebrated Stephen’s first Christmas in the NICU with a little tree and gifts to open. Brittany and Evan had to face the reality of juggling their time with Stephen with their work responsibilities. 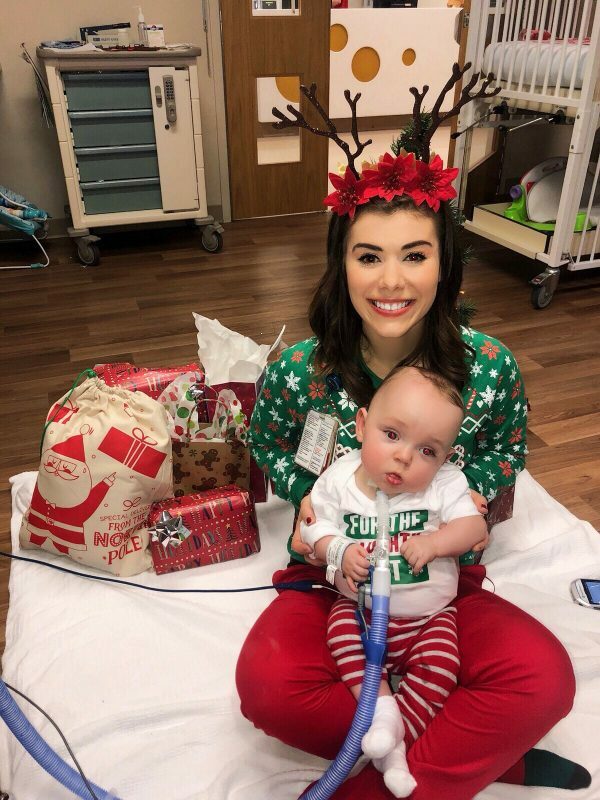 She had already used 2 of her 12 weeks of her FMLA (family and medical) leave before Stephen was born, and even though she would prefer nothing more than to be in his NICU room 24/7, she had to return to work in April in order to preserve some of her leave time for his homecoming. Their NICU routine came to be spending every weekend with Stephen, as well as Tuesday and Thursday evenings. In between, they came to count on Ashley and Becky for regular updates. Several of Stephen’s nurses gather for a “good-bye” photo. So homecoming day will come with mixed emotions, for sure, for Brittany and Evan, as well as Stephen’s caregivers. Heading out of the ER and to the ambulance waiting, Stephen is about to take his first outdoor breaths of ice cold Ohio January air. Stephen’s primary day nurse, Ashley Fagan, became a vital link to Stephen’s mom and dad when they could not be with him. Here, she’s with him at Christmas. The transport team wrapped Stephen in a favorite blanket and topped him with a warm “Air Bear” hat. 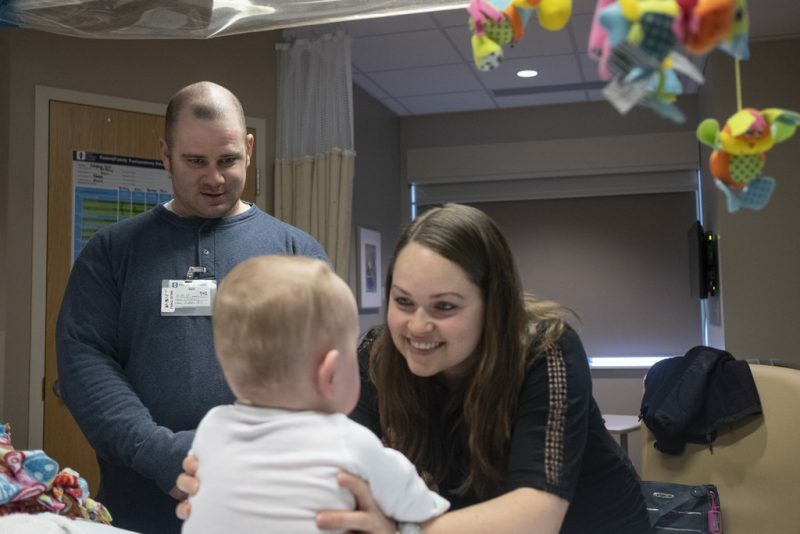 For 11 months, Akron Children’s NICU team has helped Stephen Hill overcome seizures and chronic lung disease — 2 of the main issues associated with his prematurity.